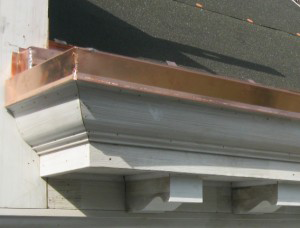 Inlayed gutters are perfect for homes with specific and intricate detailing. Inlayed gutters are installed in a decorative or structural element in which only a small portion of the gutter is visible from the ground, leaving the focus on your home, not you gutters system. 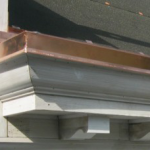 While inlaid gutters are less common than other systems, and while they are traditionally found in older Victorian style homes, Custom Installations has many years of experience installing and servicing inlayed gutters for a variety of homes and designs. Inlayed gutters help home owners and their guests focus on the ornate detailing of a home instead of the often ordinary gutters. As a trusted gutters installation company, we have the knowledge and skill to install and inlayed gutters on your home. We have performed gutter installation in communities throughout the Chicagoland area, in places like Lake Forest, Highland Park, Winnetka, Kenilworth and beyond. To learn more about inlayed gutters and to see if they’re right for you and your home, contact us today.